I am finally back from New York City! I had a blast, saw a lot of great colleges, narrowed my top three choices down to Vassar, Columbia, and NYU, and met loads of great people! There will be tons of posts coming all this next week about my trip, and I am excited to share a lot of that with you. One of the many people I met while in NYC was Aimee Friedman, YA author and editor at Scholastic. I saw her at Teen Read Night on Wednesday, where she read from her latest book Sea Change and answered a few questions. I read Sea Change on my way to NYC, and it is fabulous! Sea Change has all the makings of a perfect summer read: an idyllic, wonderfully descriptive location, a lush romance, and plenty of secrets to keep the reader turning pages. The exposition of the novel is slightly bumpy, but the rest of the book flows quite smoothly as Miranda discovers that there's more to her family and the island than she anticipated. The more mystical elements of the book are well developed and placed just right throughout the book, making it a mysterious and intriguing read. 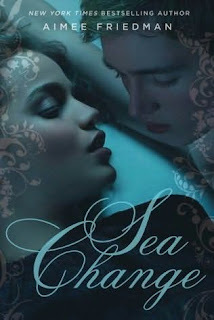 The best thing about Sea Change is that it is not just about romance or Miranda and Leo’s relationship; it's a book of discovery as Miranda learns the truth about her family, grapples with class distinctions and doing what is right, and learns to open up her mind to new and sometimes scary ideas. Because Miranda and Leo don’t really get very serious in their relationship, Friedman’s open but optimistic ending is easier to accept and quite fitting. Sea Change has just a touch of enchantment in it, and plenty of real life situations and issues that everyone faces at one time or another, making it an ideal and wonderfully captivating summer read that leaves you with high hopes for another summer (and sequel). Cover Comments: This cover is so divine! The colors are perfect for the ocean setting, and the intimate (yet chaste) position of the models is very alluring and romantic. The added details of the swirls on the sides make this cover look very soft as well. This is definitely a romantic, appealing cover, but certainly not in a trashy or cheap way. I love it! Sounds really good, I'll have to check it out. Nice review! I've heard so many good reviews on this book. I'll have to read it soon. So glad you enjoyed your NYC trip. It wasn't too hot? I met Aimee briefly at BEA and got Sea Change signed. Need to read it soon! This one is on my list--it sounds great. And good luck with the colleges! And yay! Sea Change will have a sequel!! I am very excited to hear that there will be an up coming sequal. A notice for when it will come out would be greatly appreciated. This book truly took my cousin's and I's breathe away!! Wow. You've convinced me to track this one down! THANK YOU for mentioning that a sequel is in the works! I love this book and burned through it in one day. THANK YOU for noting a sequel! I love this book by Aimee Friedman and read it in one day. She can do quite a bit with character and story development for a sequel. I have recently just finished this book. I am normally not a reader, but this book made me never wanna put it down. i checked out of my middle school library and oh my god! this boo is a excellent book and i would recommend it to people who like certain love books about a young teenager who is changed on a new island from a dork to one of the populars of the island! I love sea change I've read it a few times and I'm currently reading again. I emailed Aimee a few months back and she responded. I had asked if she intended on writing a sequel and she said yes, though she doesn't know when because shes quite busy but if were all patient it'll be here as soon as we know it.